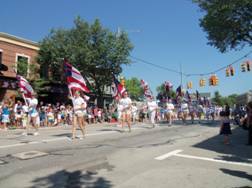 The annual Independence Day Parade (4th of July Parade), presented by the Milford Historical Society, actually takes place on the Monday, the 4th of July, this year; however, it will not take place using the usual parade route. Due to delays in the road construction project on E. Commerce Road, the Milford Public Safety officials have decided that it would d be unsafe to use E. Commerce Rd as part of the parade route; therefore the parade will start at the corner of N. Main Street and E. Commerce Road. People desiring to view the parade should not set up their chairs along E. Commerce Rd in front of the Milford Historical Museum. The parade can only be viewed from Main Street this year. The parade will still proceed all the way down Main Street to the corner of Main and Huron Streets. The change in parade route has also necessitated a last minute change in the parade line-up locations. The parade participants will line up on N. Main Street, N. Milford Road, Detroit Street and Union Street, north of Detroit St. If you are a parade participant you can find your parade slot by clicking here to see the line-up map. All parade entrants should plan to enter the line-up streets from Summit St. There will be street guards at the north end of the line-up streets to give people more information about their parade line-up slot. The parade steps off at 11 AM, but line-up for the parade starts at 10 AM. Due to all of the road construction and detours, parade participants should allow extra time to get to their line-up positions. If you have questions about the parade roue or your line-up slot and location, call parade co-chairs Norm Werner at 248-763-2497 or Rich Harrison at 248-935-5556. Following the parade the Huron Valley Rotary Club will be hosting family fun activities in Central Park leading up to their annual Duck Race, which will be at 3 PM. Plan on spending the day in Milford. There’s nothing more American than marching in the 4th of July parade, so get your group or organizaiton signed up and get into the parade! Come celebrate the birth of this great nation in small town America. If you can’t or don’t want to march, come watch. The parade steps off at 11:00 am at the corner of Commerce Rd and Union St.